Tyrone made amends for last years final defeat, to take the TG4 All-Ireland Intermediate Ladies Football title with a 6-8 to 1-14 win over Meath at Croke Park. 12 months ago the Red Hands suffered three-point loss to Tipperary, and despite Meath opening the scoring this afternoon in Croke Park, Tyrone quickly found their groove, with their goal-scoring prowess key to victory in this game. By the break both sides had amassed seven scores, but Tyrone had the ball in the Meath net on four occasions at that stage – Gerry Moane’s charges with a keen eye for goals. Neamh Woods, Niamh Hughes and Gráinne Rafferty all rattling the back of the Meath net at that stage, and despite the efforts of Stacey Grimes (1-5) among others in the second half, Tyrone held out to take their first adult title since their 1999 All-Ireland Junior success. 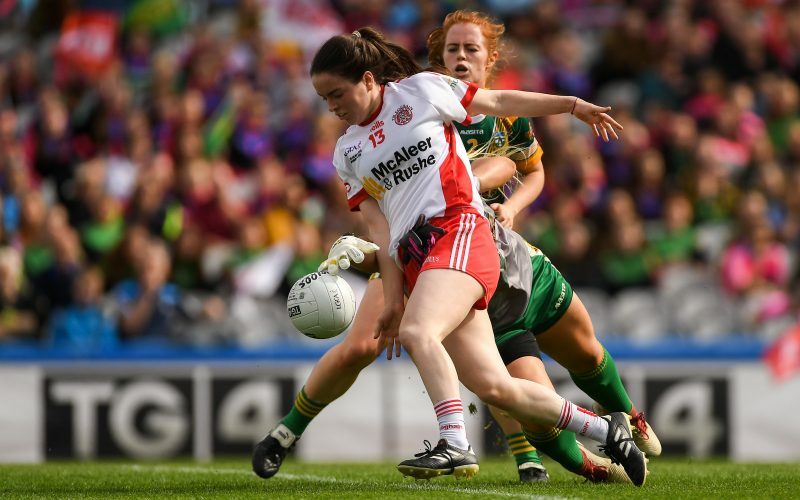 Both sides were eager to get off to a strong start, but inside the opening 90 seconds they had fired a wide each, with Niamh Gallogly initially wide for Meath, before Rafferty was wayward of the target for Tyrone. It wasn’t until the fourth minute where the opening score was produced through Meath captain Niamh O’Sullivan – the first of two points for the Royal Gaels player over the hour. Rafferty fired another wide for Tyrone from their second attack, but it wasn’t long before her side found their goal-scoring groove. A great team move involved Gemma Begley, Emma Jane Gervin, Áine Canavan and Rafferty, before captain Woods sent the first of her two goals to the net. This effort handed Tyrone a 1-0 to 0-1 advantage after just five minutes, and saw them take a lead they wouldn’t relinquish over the remainder of the hour. It kick-started a period where they scored 3-1 unanswered, with Chloe McCaffrey adding a point before further goals from Niamh Hughes and Rafferty. Hughes showing great pace, skill and control in the ninth minute, before Rafferty rounded Meath keeper Monica McGuirk four minutes later, and by the 13th minute Tyrone led by nine points. Meath worked hard to get back into this game, with three unanswered scores. A Stacey Grimes pointed free kick-started this run with Meath’s first score in 11 minutes, before efforts from Niamh O’Sullivan and Fiona O’Neill from play. Gemma Begley responded with a free for Tyrone, but this was a blip in an otherwise bright Meath spell, as further scores from Megan Thynne and Grimes cut the gap to four points with five minutes to go before the break. However, Tyrone bagged 1-1 either side of the break unanswered, including a Niamh O’Neill goal before half-time, which helped them to a 4-3 to 0-7 interval lead. Skipper Woods found the net for the second time inside 90 seconds of the restart, with O’Neill adding a point, as Meath’s great efforts were once again wiped out. Tyrone led by 5-4 to 0-7 at this stage, but for the middle third of the second half the sides were well balanced, matching each other score for score. This changed once more when Gemma Begley found the net with 13 minutes remaining, and although Stacey Grimes netted a penalty with six and a half minutes remaining it was mere consolation for Meath. Tyrone held out to earn a rare adult All-Ireland success, with Neamh Woods accepted the Mary Quinn Memorial Cup from LGFA President Marie Hickey after the game, after accepting the Player of the Match award minutes before from TG4 Head of Sport Ronán Ó Coisdealbha. Scorers for Tyrone: N Woods 2-0, N O’Neill 1-3, G Rafferty 1-2, G Begley 1-1 (0-1f), N Hughes 1-0, C McCaffrey 0-2. Scorers for Meath: S Grimes 1-5 (1-0 pen, 0-3f), N O’Sullivan 0-2, F O’Neill 0-2, O Lally 0-2, V Wall 0-1, M Thynne 0-1, E White 0-1. TYRONE: S Lynch; E Mulgrew, C Conway, E Brennan; N McGirr, S McCarroll, J Barrett; N Woods, EJ Gervin; N Hughes, L Quinn, A Canavan; G Rafferty, G Begley, C McCaffrey. Subs: N O’Neill for Canavan (12), M Canavan for Quinn (43), E Hegarty for McCaffrey (51), C Hunter for Barrett (55), C Kelly for Begley (58). MEATH: M McGuirk; O Lally, O Duff, K Newe; N Gallogly, S Ennis, M Thynne; M O’Shaughnessy, K Byrne; M Farelly, A Cleary, V Wall; S Grimes, N O’Sullivan, F O’Neill. Subs: S Wall for Cleary (10), A Leahy for Gallogly (37), E White for O’Neill (45), B Keogh for Ennis (52), S Powderly for Byrne (52).